Departing Vancouver late Wednesday night on the eve of the long weekend to Seattle Washington, the first stop, drinks needed. All travel is to be considered in “Defender Time”, a measurement of time translated as the travel time of a 4-cylinder, 2-ton tank. We’ll get there, anywhere, just not fast so enjoy the scenery. The usual West Coast adventure takes you down the scenic coastal highway 101, but this time we are travelling inland where we will see 3 out of the 7 wonders of Oregon. I spend a lot of time at rest stops. 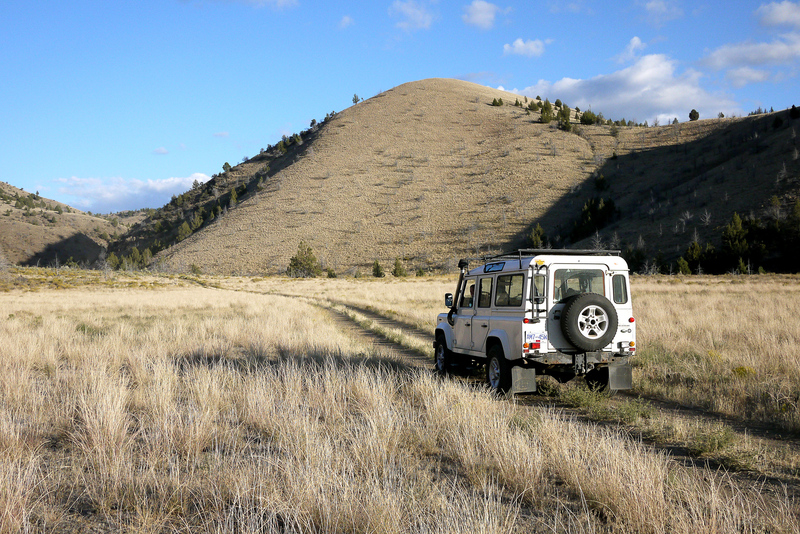 The integral part to all adventure mobile travel plans, the mid-way to the way there. The first night is simple. Out of the city and halfway to Portland Oregon, stop, rest, and then breakfast. 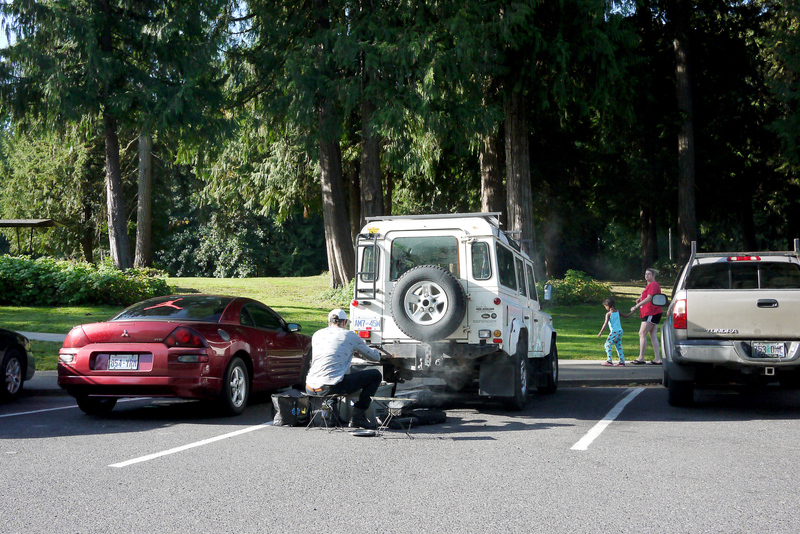 Rest stops include flushing toilets, sinks, potable water, picnic areas, and usually free coffee. The perfect setup for an ideal tailgate breakfast. Packing the truck is an art form, so is the grocery list. Food corresponds with the carefully packed modular cookware and needs to carry over from meal to meal. Skills I have learned from camp and catering. 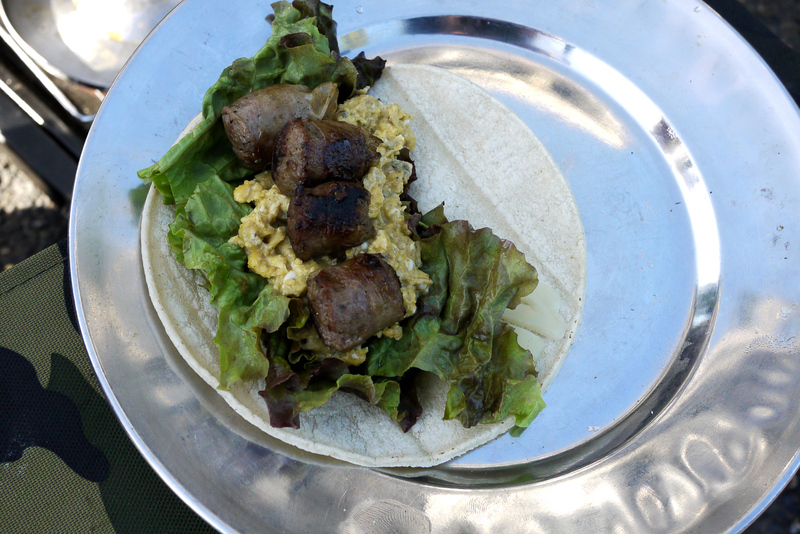 This breakfast, elk sausage (previously frozen and acts as an ice cube), scrambled eggs on corn tortillas, which will also be used for lunch. 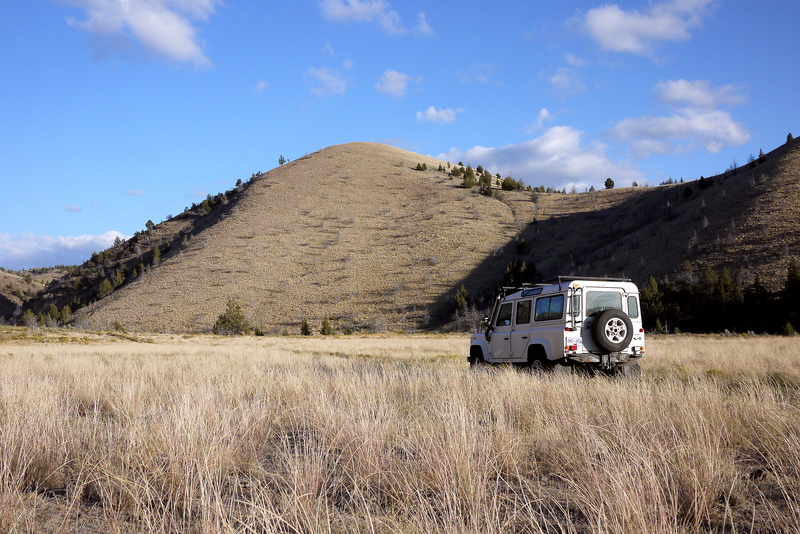 Travelling off of major roads and eastward into central Oregon passing through multiple protected National Forests with sterling scenery, surrendering everything to the open country. There isn’t much other than you, your truck, and the occasional gem of a general store. I advise you fuel up when you pass one, it may be a while before you pass another, and you don’t know what gems are inside. Such as, the best ice cream the west has to offer. The huckleberry is a native berry of the Pacific Northwest, the state fruit of Idaho, and the best cone of your life. The first wonder of Oregon is Crater Lake, an unsolved wonder of stunningly blue water surrounded by two thousand feet high cliffs. The lake sits within a caldera of a collapsed volcano. There are no rivers that flow into the lake, which is the deepest lake in the United States and is only fed by precipitation and snowmelt. There is one entry point to the water; a steep walk down for swimming and boat tours but most of the lake is viewed from above. The drive around the rim of the lake is a windy 53 km of unparalleled views from over 30 pullouts. Off of the road there are multiple hiking trails and picnic areas for day-trippers. 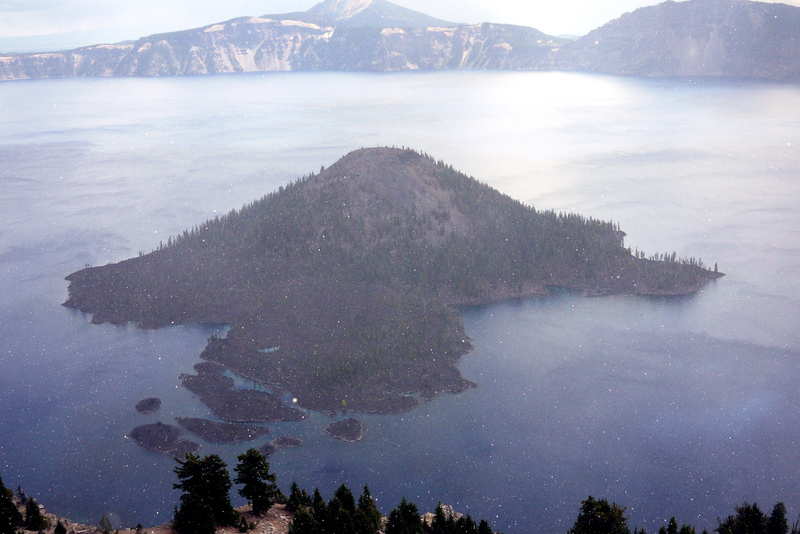 Crater Lake National Park is a spectacle in its entirety. There are four evident forest zones as you enter the park changing the scenery as you ascend to the rim of the lake. We took the short hike up to Watchman Overlook to get a better look at Wizard Island, a cinder cone formed from volcanic eruptions 7,300 years ago. In the short gain in elevation we were faced with hail, the first reminder (of this trip) that weather considerations are to be made in altitude not just latitude. Back on the road heading northeast, destination Smith Rock, another wonder of Oregon. 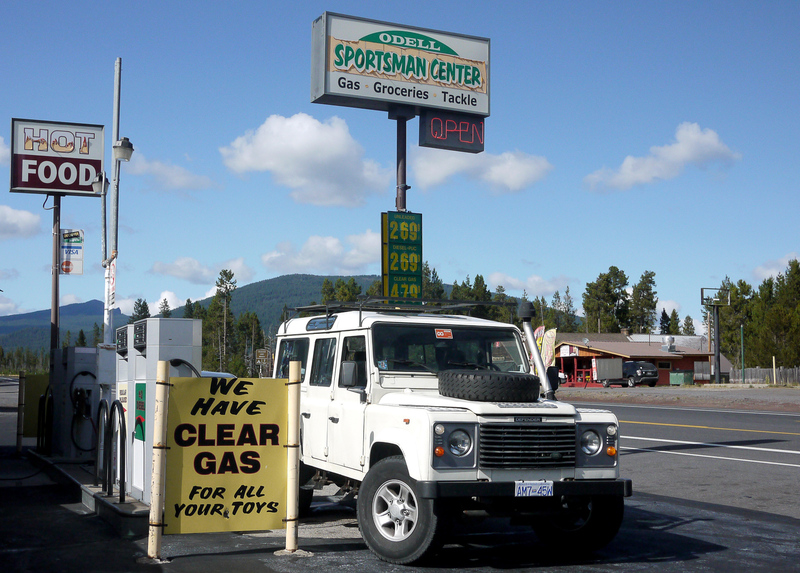 Pit stop, the city of Bend Oregon. Bend is a perfectly situated stop in between Crater Lake and Smith Rock. 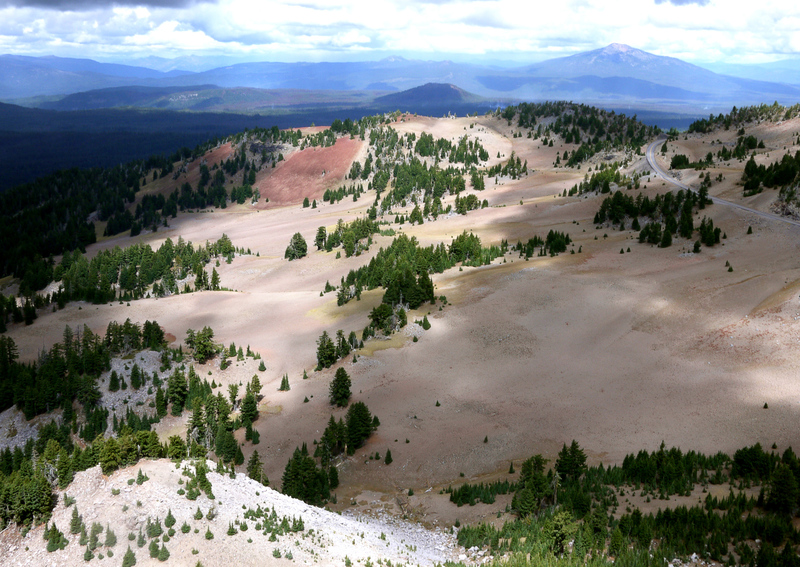 It also is on the dividing line from Ponderosa Pine forests, the lower most part of Crater Lake National Park, and high desert region characterized by dry land and shrubs. What must be noted in Bend is Hong Kong Restaurant, 530 S.E 3rd Street, Bend Oregon. The textbook version of a Chinese restaurant own and ran by Chinese settlers complete with casino and lounge. The Bamboo Room Lounge, connected through a back door at the rear of the building. Ask for the local menu and a Mai Tai. 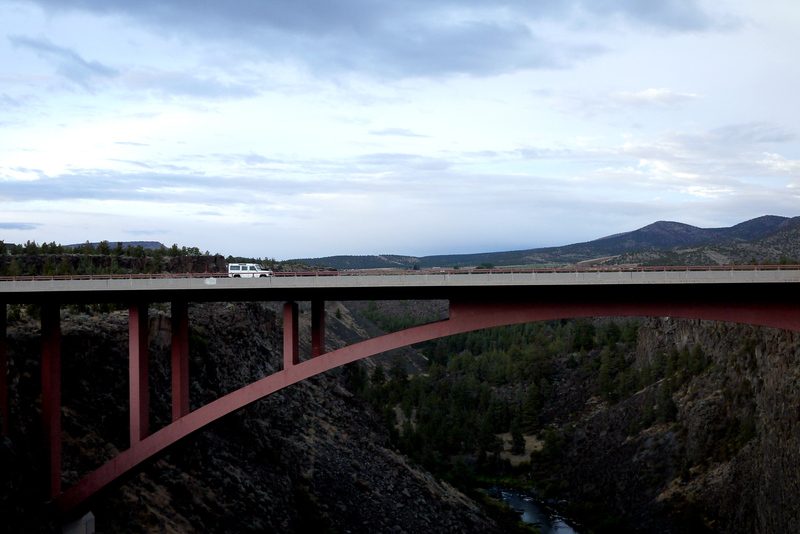 On route, we drove over the Rex T. Barber Veteran’s Memorial Bridge that spans 300 feet over the Crooked River gorge. The first instance we will witness the effect that the river has on the areas geology. 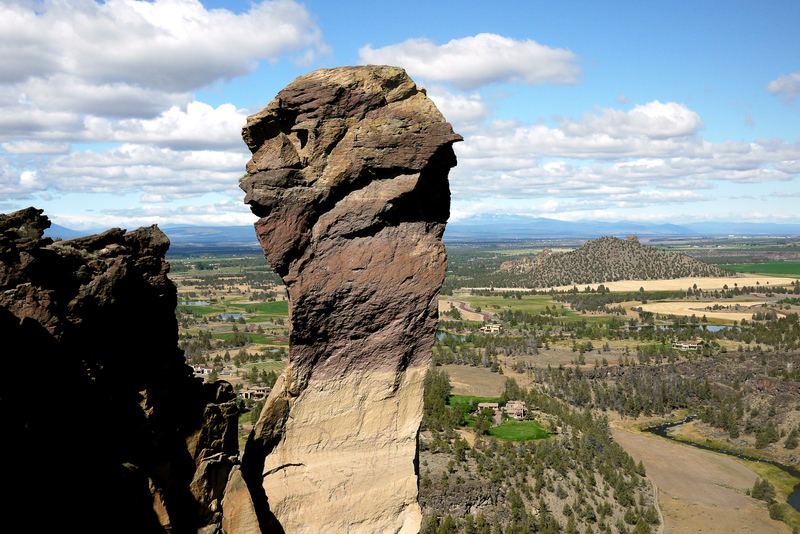 Smith Rock State Park, a place commonly referred to as the birthplace of American sport climbing. The 600 feet high rock face has over a thousand bolted climbing routes, miles of hiking trails, and a well-facilitated community-liked campground. The Crooked River carves through the rock creating a picturesque valley and showcases centuries of geology within the rock. We camped out at Smith Rock for the night, sharing a picnic table with a couple from Seattle who comment that Canadians drive too fast (ya, right). The facilities include showers, kitchen wash area, tent camping, and car park. We decide to leave Smith Rock later in the afternoon, as the camping situation around The Painted Hills was unknown. But when you can leave the certainty of the pavement, it’s amazing where you will end up. 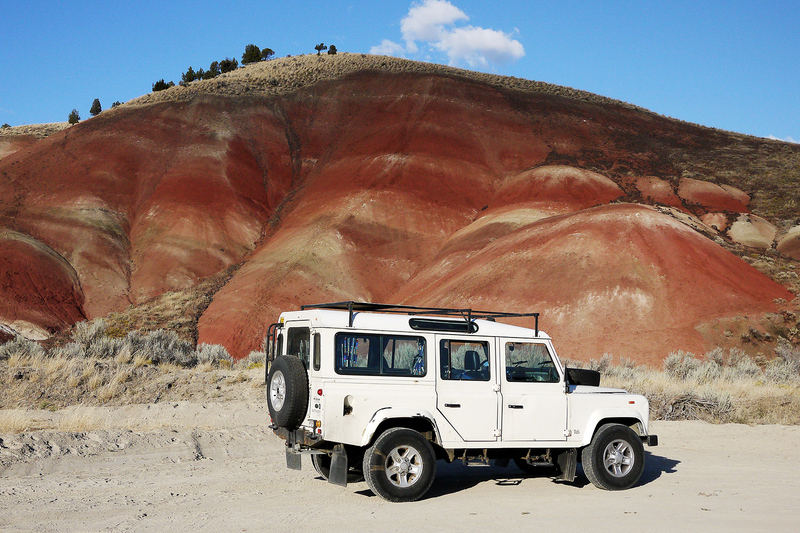 Still in dry country, the Painted Hills is a geographic showcase and one of the wonders of Oregon. Featuring five separate hiking trails allowing you to view the landscape from different perspectives. Thousands of years of volcanic activity, indications of changes of vegetation, and evolving environment contribute to the dramatic scenery. Due North. From the Painted Hills in the desert region of Oregon destined for The Gorge Amphitheatre in Washington. It’s a six-hour drive through winding dry hills with blue-green rock layers painting the horizon, as you leave the dry regions of Oregon reaching the top the ridge of the deep gorge, turbines dotting the sky. 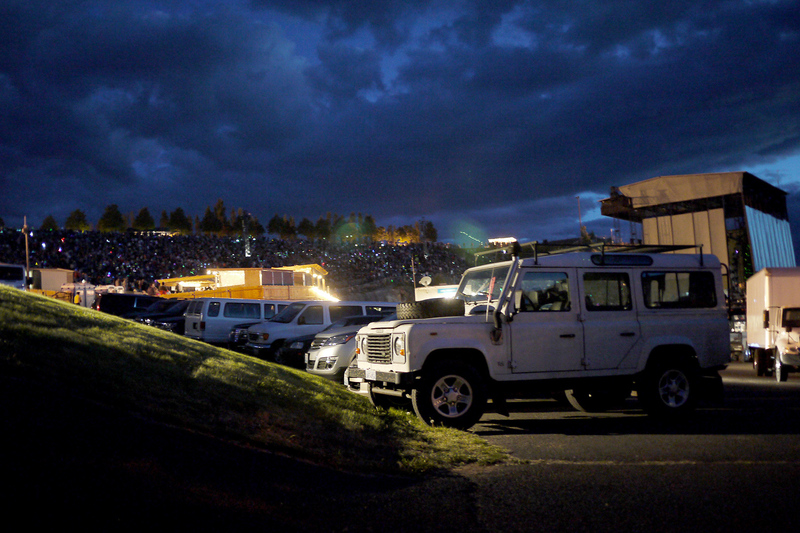 The Gorge Amphitheatre, an outdoor natural amphitheater overlooking the Columbia River, where Sasquatch Music Festival takes place as well as a full summer of concerts and camping. We caught a concert and shared some bubbly with friends. Am I a bad 80’s kid for not knowing a Dave Matthews Band song? We wanted breakfast. 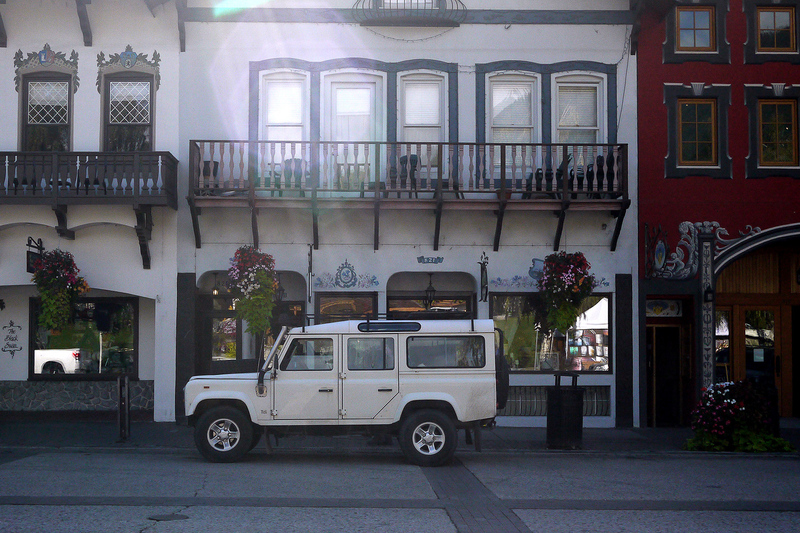 Not far from The Gorge is Leavenworth Washington, a completely Bavarian styled town, the concept conceived in 1960’s as town planners thought that the only competing scenery was Bavaria itself, so they sought to mimic it. The small town features authentic building facades, nutcrackers, multiple waffle haus, and festivals yearlong. The total trip was five days travelling 2,824 km through four forest zones, two states, up and over varying elevation. 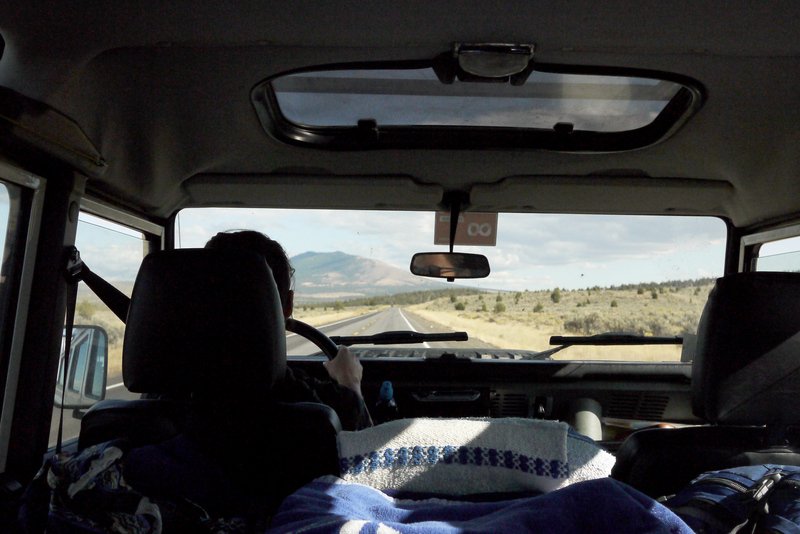 Nights were spent camping in The Defender, which is setup to camp two comfortably, if two can fit on a 36” bed. Days we drove, hiked, and observed. I once thought a road trip was point A to point B and back again. What I know now is, is that is not the A and B that matters but the spaces in between. The trail is yours to defend. 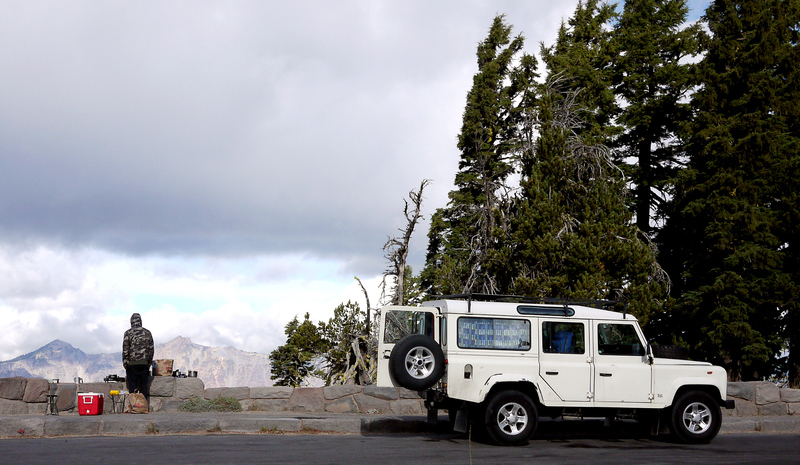 Making work look like play, Jackie Sakaguchi is a music industry professional and overlanding enthusiast. Classified as a need, not a want, her 110 Land Rover Defender is a sigil of her personality destined for the best snowboarding, surf, and off highway vehicle camping.